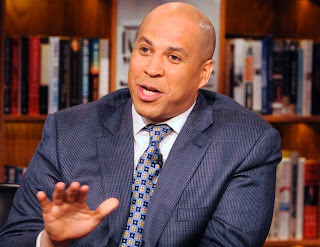 Mayor Cory Booker (D) announced today that he would complete his second term as Mayor of Newark, NJ dispelling long time speculation of his plan to become Governor of New Jersey. In a video address posted on the Mayor's Youtube page, Booker announced his next political move. ”I will complete my full second term as mayor. As for my political future, I will explore the possibility of running for The United States Senate in 2014, he stated. He also used the announcement as an opportunity to praise his administration for its success. "We are at the center of America's efforts to reform education," he stated. "Amazingly in a down economy Newark is in its biggest period of economic growth since the 1950's," Booker continued. While Booker had been criticized for being too often out of town, making television appearances and building his celebrity star power, Booker has argued that his networking is responsible for the city's economic growth. The senate seat is currently being occupied by Sen. Frank Lautenberg, who at 88 years of age is the oldest member of the Senate. Lautenberg has said he would seek reelection in 2014. For the last few months many have anticipated a political bout between Booker and Governor Chris Christie (R), who had recently gained an edge in polls in the wake of Hurricane Sandy. While the speculation surrounding the two rising political heavyweights signals it would have surely been one to watch, it looks like spectators will have to hold off on that match. Presidential election anyone? ?